In 2007 the Labour-led government announced a royal commission of inquiry into Auckland governance. There was concern that Auckland's existing local-government structure, consisting of four city and three district councils as well as the Auckland Regional Council, was too complicated, and was impeding progress. One of the reasons for the commission was to give the public an opportunity to participate in the decision-making process through submissions. 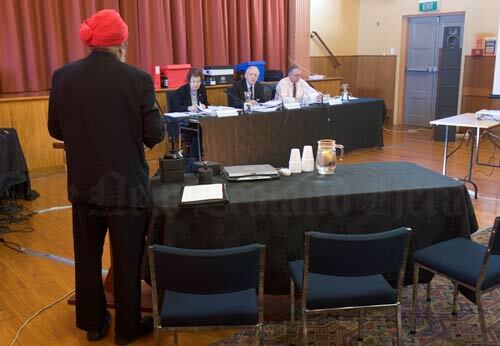 Here, Ganges Singh of the Counties Manukau Ethnic Council makes a submission to the commission at the Pukekohe town hall in May 2008. Seated are commission members (from left) Dame Margaret Bazley, chairman Peter Salmon QC and David Shand. The National-led government that took office in 2008 implemented only some of the commission's recommendations.